Thanks go out to Dan for sending me the link to this fine food packaging. While I have concerns about the overall typographic choices and unappetizing use of poorly lit product photography, I am even more befuddled by the product itself. 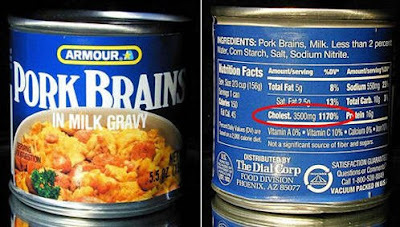 What are pork brains? Wouldn’t brains need to come from a specific living entity? Pork, as I understand it, is not a specific living entity. Perhaps they are pig brains? Was using the descriptor pig brains instead of pork brains considered too risky from a sales standpoint? I must admit though, the cholesterol intake per serving is phenomenal. I wonder if the designer called the client to confirm that the 1170% wasn’t a typo?